Just a quick post because the power has been going in and out for the last few days and I keep losing the internet connection. 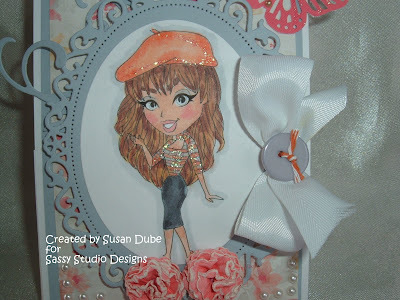 I wanted to share my first easel card, France Honey, from Sassy Studion Designs, that I did for a challenge SSD is sponsoring for Brown Sugar Challenge. 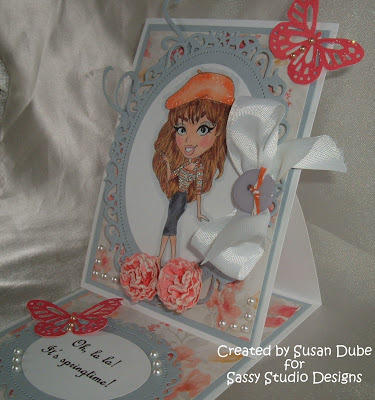 They are looking for a step or easle card and I thought I'd finally try an easel card. What fun I had making this! I'd be making them for a long time if I knew they were this much fun and so easy! 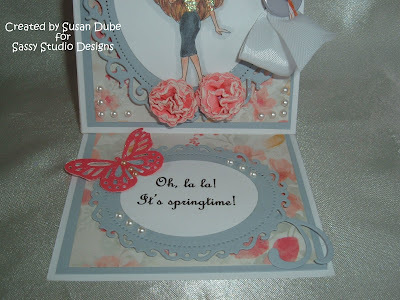 I followed the instructions on splitcoaststamper and it was so easy I could hardly stand it! She's colored with copics and I added some Stickles to her hat and top. She's cut out and mounted on the floral oval die cut, and I added some swirls, all by Nestabilities. The button and pearls are from Studio 112, the butterflies are from my Martha Stewart punch, and the flowers are homemade. I love this gorgeous paper from My Mind's Eye. Michael's has some beautiful 6 x 6 pads and I think I have most of them! I love the greys and peaches together. Here she is up close. Isn't she just stunningly gorgeous? I love that european look she has! Here's a side of the card. And this is a close up of the inside. Gosh I had fun making this one! Make sure to pull out your stamping and scoring stuff and head on over and join in the challenge. Go have some fun! 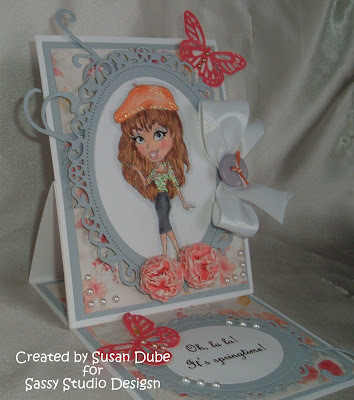 Beautiful card, Susan... I absolutely love your flowers! Oh, you have captured Paris in the springtime with this card. The colors are soft and lovely. The flowers you made look like beautiful carnations and you coloring is spot on. BTW love the glitter too. She looks gorgeous, right down to her blue eyes and her pretty makeup. Thanks for joining us at the Brown Sugar Challenge Blog. I love the color combo!!! You did excellent on your first easel card!!!! Beautiful card with a lovely colour. Thanks for joining us at Brown Sugar. Susan, this is beautiful! What a great first easel card. I love the sparkle of course and the colors you used. Another beauty! I love it! Gorgeous card, thanks for sharing it in the Brown Sugar Challenge.